On Tuesday we walked from our office in Primrose hill- walking through regents park and into the bustle and noise of central London- ending in Soho to have lunch at Kricket. Popular new modern Indian restaurant. It opened at the beginning of the year- the much-awaited spin-off of the tiny Brixton original. Delicious small plates served up by young chefs, Indian street food style, to a hungry crowd. We sat at the marble countertop watching the open kitchen in action, we love opting for bar top eating when it comes to these kinds of lunches- to sit and watch the theatrical scene; of energetic chefs flipping hot crispy naans, standing back as things sizzle and spit to stirring big fragrant pots of curries- makes us hungrier then even to get our own bricks and mortar. The dishes had the perfect clash of Indian and British flavours, an excellent harmonious fusion. Which, like most of our monthly outing feast, got us inspired. 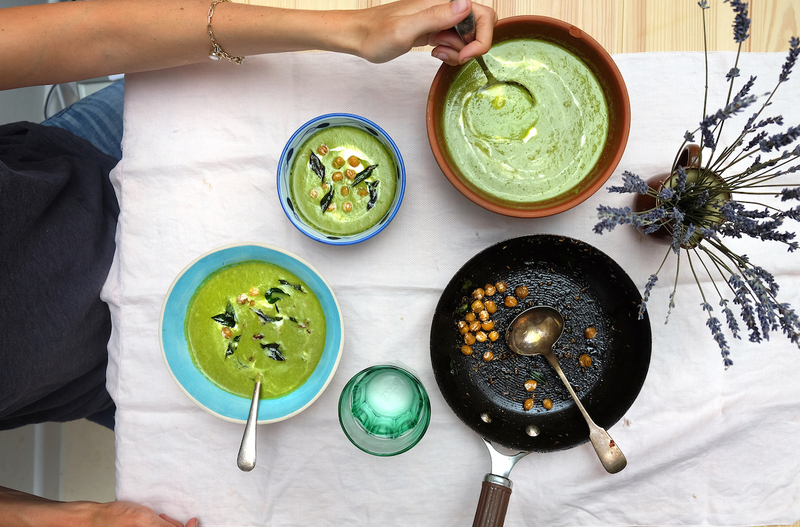 We have made a soup that feels fresh, healthy and substantial- but with subtle Indian spice. 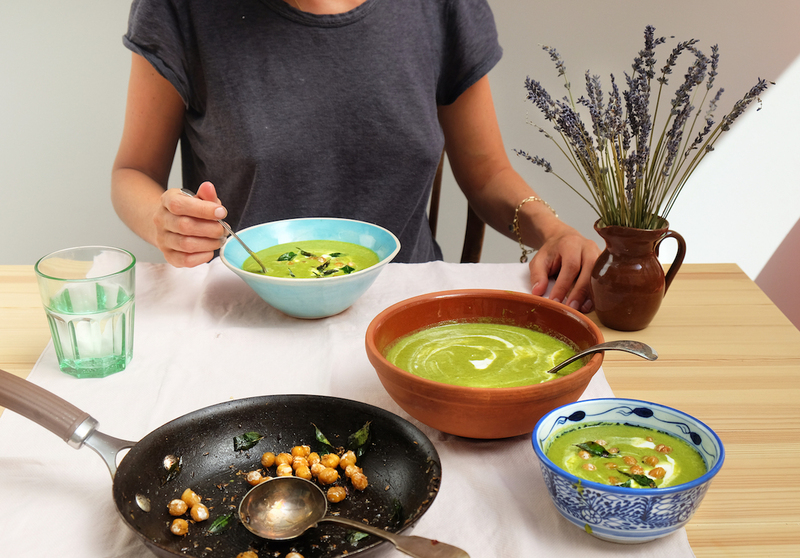 This recipe is very quick and easy to make, very important to not put the lid on top when making a green soup like this- it will discolour the punchy green. We have used chickpeas here to serve on top, which crisps nicely when fried- but you could change for sourdough croutons crisped with the spices. Wonderful with a swirl of yoghurt, which you could add a little chopped red onion to for crunch. 1. Sauté onions with celery, garlic, chilli and coriander stalks with coconut oil (or oil of choice) in a soup pot. When beginning to caramelise add your two tsp of curry powder, stir for another minute until fragrant and then add the wine and stock. Simmer for around 5 minutes. 2. Add the chopped lettuce, wilt down, then add the frozen peas. Cook for a further few minutes. Take off the heat, put in a blender, blitz till smooth. Season generously and add a good squeeze of lemon. Taste for adjustments. 3. Get a frying pan hot with groundnut oil, add the chickpeas and start crisping, then add the curry leaves, cumin seeds and a good pinch of sea salt. Cook for a further 5 minutes, stirring. 4. Serve the soup hot in bowls, nice to do a swirl of yoghurt, and then top with the crispy chickpea mix.